Time management always baffles me. Time is so mercurial. We humans have figured out how to measure it, and we can predict somewhat how we can negotiate our way through it when faced with a time-sensitive task, but not much thought goes into how that negotiation actually happens. I suspect this is because if we do try to figure it out, our heads will explode. So, you have a finite amount of time to tech a show. Tech-ing a show means that you take the performance of the play that the actors have rehearsed in the rehearsal room, bring it into the theater, and then spend that finite amount of time prior to the final dress rehearsal adding every remaining technical element that gives the production its physical identity. Months or sometimes years before a production goes into technical rehearsals, designers are preparing their work. Director Carey Perloff shared costume designer Linda Cho’s wonderful costume designs with me back in February. These were completed and did not change much subsequently, so Linda and Carey were undoubtedly collaborating on their ideas well before. 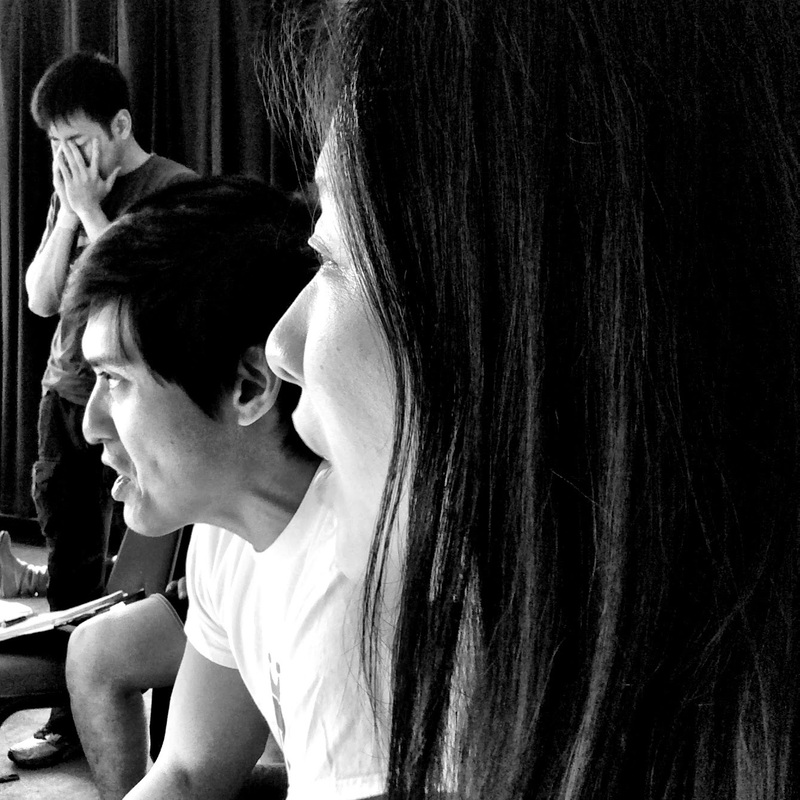 Dan Ostling and composer Byron Au Yong probably were also in conversation with Carey sometime in 2013 (I hear Byron started doing musical sketches almost immediately, and that Carey and Dan “storyboarded” the entire play—choosing a scenic identity for each of the many scenes—for about a year). Lap Chi Chu, as lighting designer, probably does his most intensive work once an initial scenic concept is established, and his work becomes a collaborative response to that, as well as to Carey’s direction and Linda’s costumes. Jake Rodriguez is the sound designer and not only designs the entire equipment plot for the enhancement of the actors’ voices through artful miking (we have challenges balancing our particular show as the actors’ voices need to be heard over loud percussion instruments, for example), but he also works with Byron on the soundscape (i.e., sound effects). Sound design is the unfortunate, neglected sibling of the design family, as it is a design element underappreciated by nearly everyone. Perhaps this is because sound does not have a tangible entity, something you can look at or touch. 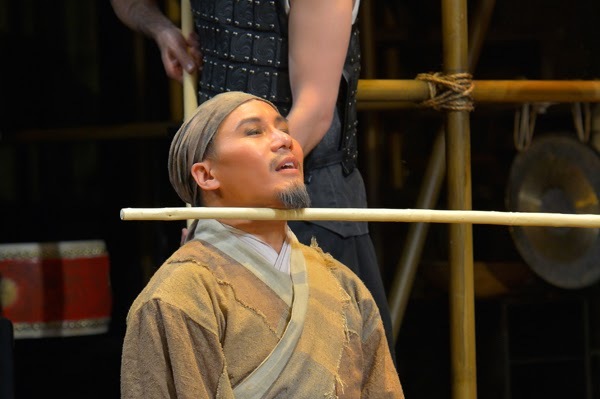 There is no excuse for omitting the value of a good sound designer’s contribution to a production while one gushes over the lighting, scenery, and costumes. Everything is either about you (and your—or your character’s—track of whatever show it is that you’re doing). . . .
. . . Or everything is about you (and your—or your character’s—track of whatever show it is that you’re doing). Those are the two choices; pick one. This is because you are about to put yourself on the line and go out there in front of paying people in a rather exposed way, so you are somewhat vulnerable to worrying about whether or not the new elements—the clothes, what you’re standing on, what you’re hearing, everything else—is going to mess you up in any way. If something does mess you up, then you worry whether or not it will be the permanent kind of messing up or the kind of messing up that you can deal with gracefully if you make a manageable adjustment. Usually the tech phase of a production coincides with both the final stage of committing the text to memory, as well as a growing comfort with the staging after working on it for weeks, and I find that this is the time when I am the most stressed out. It’s challenging to be trying to get your brain to install the text in a text-challenging play to a word-perfect place, right at the time when the physical elements are being introduced to you—i.e., change. This isn’t totally fair, though. The rehearsal process is usually closed so that actors can work these things out in privacy. Furthermore, it can’t be overstated how important an actor’s familiarity with a prop that she is working with is when you consider that effortlessness is her ultimate goal. In our show, for example, there is one particular prop—an old fashioned medicine chest—that must not only hold a variety of other props within it with a minimum of “scrounging around for it,” but it must also be handled by two actors at different times in very different ways: one gets things in and out of it many times, and the other must climb the three-story set with it strapped to his back. The prop has to work for both of them, and they each in turn must rehearse with it, so that their dealings with it are not in the least bit awkward in front of an audience, or in some cases, even unsafe.